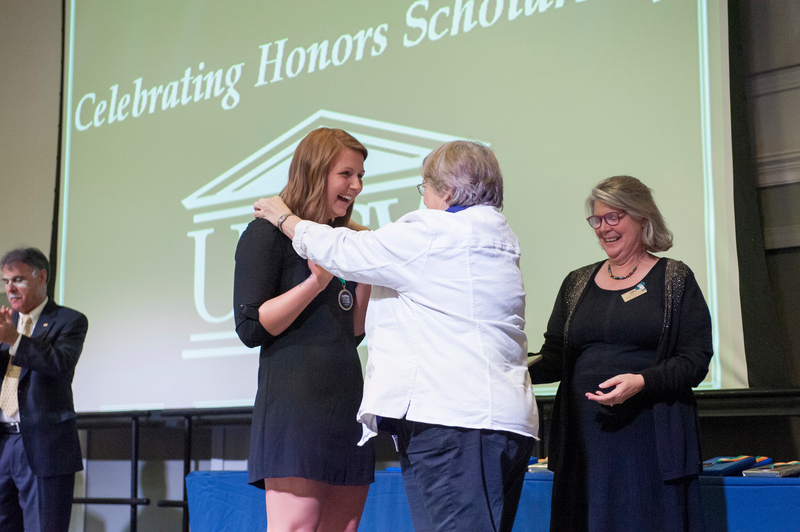 University Honors is the highest academic distinction a student may earn as an undergraduate at UNCW. This course of study involves specific required class work in enriched seminar experiences in University Studies, co-curricular activities, Honors enrichment seminars and independent scholarly research. This vibrant experience may be integrated into any major for the student and provide an opportunity for close scholarly interaction between student and faculty, more in-depth involvement within the student's academic discipline. The Honors College at the University of North Carolina Wilmington attracts and retains academically talented students, offering a powerful learning experience by encouraging curiosity, critical thinking, and independent work skills, and by developing a community of honors scholars on campus. The College is committed to offering opportunities to students as they pursue their academic passions in college. The vision of the program is to encourage and support life-long learning, including a global perspective. Note: As the Honors Program became an Honors College, requirements changed... A summary of the requirements for 2012-2013, 2011-2012, and 2010-2011 catalog years can be accessed by clicking here. Earn a minimum of a "C" (2.00) in all honors work ("B" (3.00) in 499 and honors contract courses) and have a 3.00 overall GPA in all honors curriculum coursework. If a student earns a grade below a "C" in an honors basic studies course, the grade may count toward that student's basic studies requirements but not toward his or her honors requirements. If that student wishes to complete the honors requirements for University Honors, he or she must take an additional honors university (basic) studies course and earn no lower than a "C." Students earning below a "C" in HON 210 or HON 120 must take additional seminars, respectively, and earn no lower than a "C."
Complete requirements for Departmental Honors. *Note: students entering after the fall of the freshman year must complete HON 210 , two credit hours of HON 120 , at least nine hours of honors university studies courses, and three additional honors credits (additional honors seminars or university studies courses as honors sections, or honors contract course, or semester study abroad. Download an application for the Honors College. Students may apply to the Honors College at several times. Most students apply to enter as first semester freshmen. Applications are reviewed on a rolling basis, and because the program is quite competitive, we urge you to apply as early as possible, at least by early April. We will keep a waiting list in case spots open during the summer. Students may also apply after completing one or two semesters at UNCW, and grades earned at UNCW are weighted highly. Transfer students are also urged to apply. Any current UNCW student or transfer student may apply for departmental honors in the junior or senior year if he or she meets the criteria. This application uses a different application form available in the Honors College office (second floor Randall Library). The main resource for students entering into the Honors College with information about requirements and offerings in the Honors College.